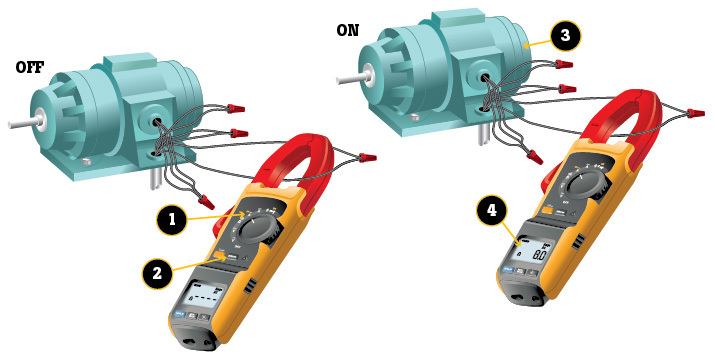 Steps for measuring inrush current, using the Fluke 381. When an electrical device is first powered on, inrush current is the surge or momentary burst of current that flows into it. Think of a car sitting on flat pavement, parked in neutral, engine off. To get it moving without using the engine, a human would need to give it a substantial push, probably a vigorous leg drive. Once moving, though, the car's wheels roll more cooperatively with less physical oomph required. That initial, emphatic leg drive is the equivalent of inrush current. The subsequent, easy-rolling motion equals the steady-state current flow that occurs in a motor once its gears and rotors have been jolted out of inertia and into motion. With the device to be tested turned off, turn the meter's dial to ‍. Center the jaw or flexible probe around the device's live wire. Push the inrush button, ‍ on the face of the meter. Switch on the device. The inrush current (spike) is displayed in the meter's display. Why does this measurement matter? Newer, high-efficiency motors draw more running current than their predecessors. Knowing the value of inrush current can help a technician locate a startup problem, whether it's in the motor or in the starting circuit. Inrush measurements are usually recorded in a preventative maintenance log for future reference. 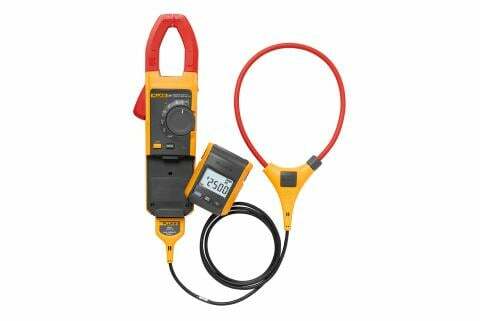 To provide repeatable motor inrush measurements, advanced clamp meters (such as the Fluke 370 series or the Fluke 381) use a "triggered" mode that synchronizes measurements with the starting current. Technicians "arm" a meter by pressing its inrush button. The meter is then triggered by the inrush current. Once triggered, this inrush function takes approximately 400 samples over a 100-millisecond period and calculates the actual starting current. Inrush current may cause a meter's display to show a value that is higher than the rating of the circuit breaker, yet the breaker does not trip. Why so? Inrush current can be 4 to 10 times greater than the normal running current, depending on the type of motor. 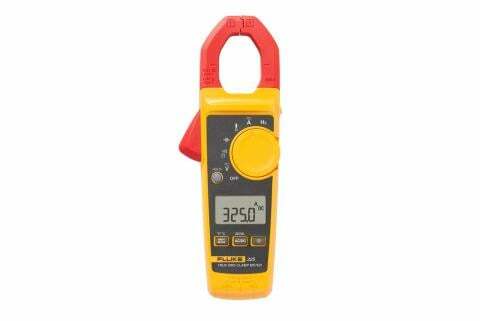 So if a motor's running current is eight amperes and its circuit breaker is rated for 20 amperes, how is it possible that a clamp meter could display a measurement of 40 amps? The reason the breaker or overload unit do not trip is because both devices work on a time-vs.-current curve. 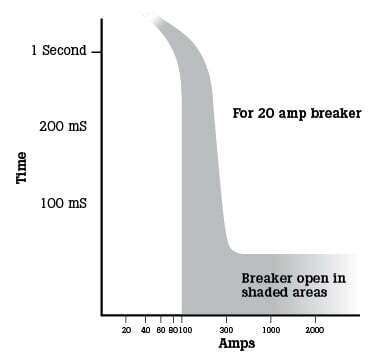 This curve (see chart) indicates how much current passes through the breaker, and for what length of time, without opening the circuit.